So far while exploring the different ways of finishing edges of garments sewn with sweater knit fabrics, I've discussed bands, binding, elastic lace as hem facing, and most recently, the mock cover stitch. With the Tangerine Top I also used another method -- a facing. My facing was not very different than any used in dressmaking, except that mine was asymmetrical. I traced and cut out a paper copy of the top portion of my front pattern block. I then had fun drawing the off-center neckline I'd imagined. The red V's above indicate my cutting line for the facing fabric and what I thought would be my turned under bottom edge. I ended up just serging that edge of the facing. The broken line, shown above, is the fold line. Paper, of course, lacks the stretch properties of knit. But pinning it on the dress form gave me an idea of how it would work. 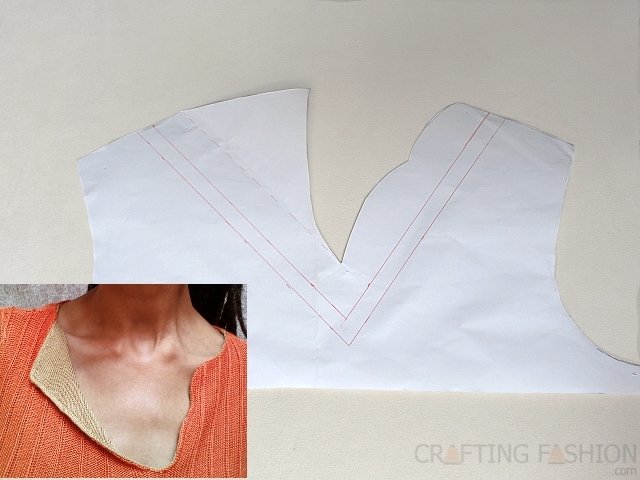 The back neck facing was a simple tracing of the neckline of the back pattern piece. The 2-inch width included the seam allowance and serged bottom edge. The fabric I used for the facing was a lighter weight knit than the main garment fabric, a jersey. I didn't use any interfacing. I'm hoping I don't regret that, but for now the weight of the main embossed rib fabric together with the jersey facing holds its shape very well. After the shoulder seams were stabilized and sewn on the top, I sewed the shoulder seams of the facing. 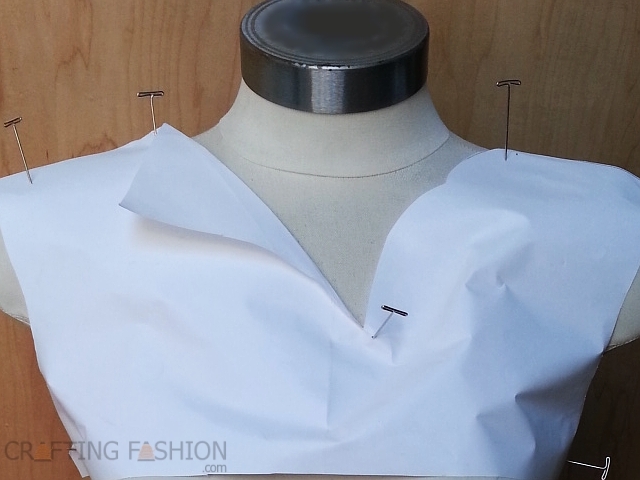 I attached the facing to the main fabric, right sides together using my serger, and stitching around the neckline. Turning, pressing, and top stitching finished it off. I now consider facings an easy finish for sweater knit fabrics. Even the asymmetrical ones! Nice! This is really different and I haven't seen anything like it since I last visited India. The tailors out there use all sorts of different necklines (the basic 'costume' is either a sari or an outfit composed of a dress type thing over a pair of pants-type things) so the variations are all in colour, weave, drape and necklines XD I like the contrasting colours you've used on yours too.